It’s a big weekend for the preppy population of the mid-Atlantic region. It’s the semi-annual J. 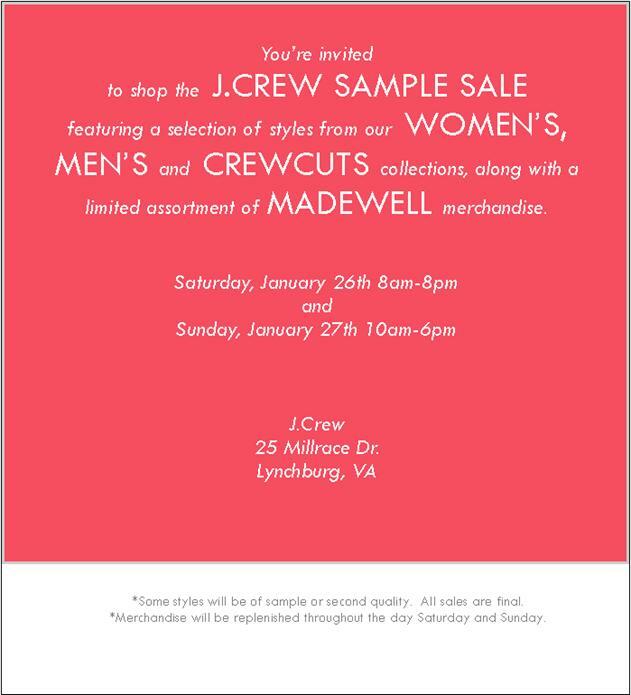 Crew Warehouse clearance sale in Lynchburg! You might think I’m crazy to drive 3.5 hours from D.C. to attend this fine event, but I assure you I’m not. This kind of sale is my JAM. We’re talking boxes of clothes and accessories to rummage through and shoes, lots and lots of shoes. The last time my friend Liz went she left with 6 new pairs of shoes for $30 a piece. I can’t wait to see what J. Crew treasures I’m going to come home with. Wish me luck! I will report out on my finds next week. Anyone else going to be there with me?